We've dropped way behind with the #VABreweryChallenge, but the opening of Herndon's first craft brewery, Aslin Beer Company, enabled us to renew the quest. The brewery is only a half mile from the W&OD Bike Trail off the Fairfax County Parkway near Reston. .I'm not familiar with the story behind the brewery, maybe someone will update us with a comment below, but I do know that they produce solid beers. And all were solid, not just a few. The Animal (Farm)house Saison was my favorite, spicy and a little funk and the In Memoria Lime Kolsch will be a biking favorite. The lime provides both creamy texture and citrus flavors. The Deceiver Imperial Stout and Mind The Hiop IPA were the big boys in ABV; but very smooth and balanced and never felt overly sweet or hoppy. The Hoppy Brown was exactly what the name suggests whereas the RTC/1857 name hides a Belgium Wit. Both, very likable beers. And as an added bonus, Cherry's Cheesecakes Catering & bar-B-Que was onsite with both options. Interesting the Deceiver worked well with the pulled pork and the German Chocolate Cake Cheescake. 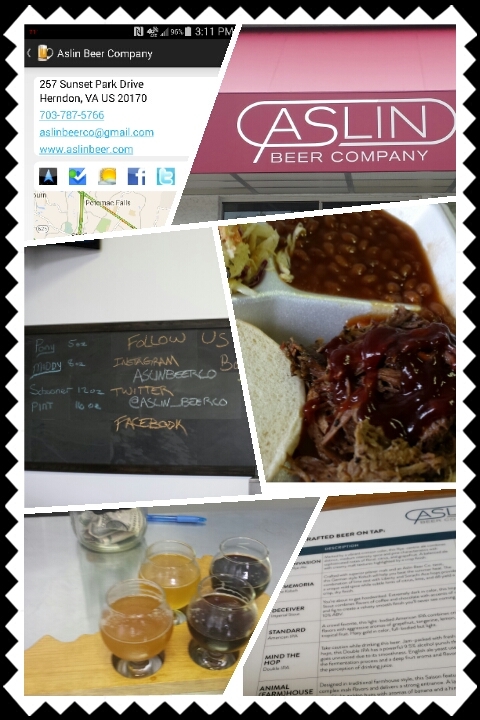 Cheers to the beginning of a wonderful relationship with the Aslin Beer Company. And theCompass Winery, Brewery, Distillery Locator Mobile App can provide the biking and driving navigation along with all contact information. Besides seeing friends, and learning about the host region, my favorite part of any Wine Bloggers Conference is the pop-up sessions or Rogue tastings that occur throughout the conference. Sometimes it's a few local wines that a participant brings to share. Other times it's marketing folks or owners of smaller wineries. I've already shared the An Intimate Tasting of Spanish Wine at #WBC15 with Finca Hispana & El Muro del Vino. One of the savviest of these Rogue agents is Craig Camp who owns and operates Cornerstone Cellars Napa and Cornerstone Oregon. Craig is active on social media and blogs regularly about both these boutique wineries. During the ride to the conference from Seneca Lake I noticed that Craig was posting invitations to sample his wine before the Keuka Lake dinner. 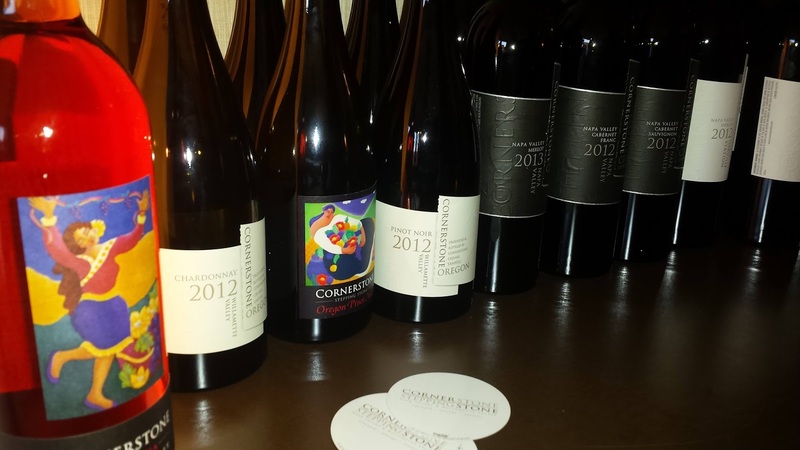 Both Cornerstone operations produce fabulous wines, so attendance was mandatory. The Napa wines were particularly stellar and are harvested from Oakville Station Vineyard (To Kalon), Kairos Vineyard in Oak Knoll, and Ink Grade Vineyard from Howell Mountain. The 2012 Napa Valley Howell Mountain Cabernet Sauvignon always stands out being luscious, creamy, with an eternal finish. The 2012 Oakville Station Vineyard Merlot is quite the wine also. Also through Twitter Constance Chamberlain (Wine & Co.) notified participants that she was pouring 25 years worth of Austrian Riesling from Wachau and Kamptal. What a great opportunity to witness the age-ability of Riesling. This was readily apparent with both the Domane Wachau Terrassen Thal Smaragd Riesling 1990 and the Hogl Wachau Smaragd Terrassengarten Loiben Riesling 1993. Both still retained a lively aroma, a creamy mineral center, and plenty of acidity. The Alzinger Wachau Smaragd Loibenberg Riesling 2003 was simply elegant. Moving towards the present the Buchegger Moosburgerin Erste Lage Riesling 2011 from the Kamptal region was delicious with equal parts texture and acids. Tasting these wines in the Finger Lakes Riesling country offered a great contrast between the more fruit forward New York version versus the mineral and creamy side from Austria. Thanks Constance. 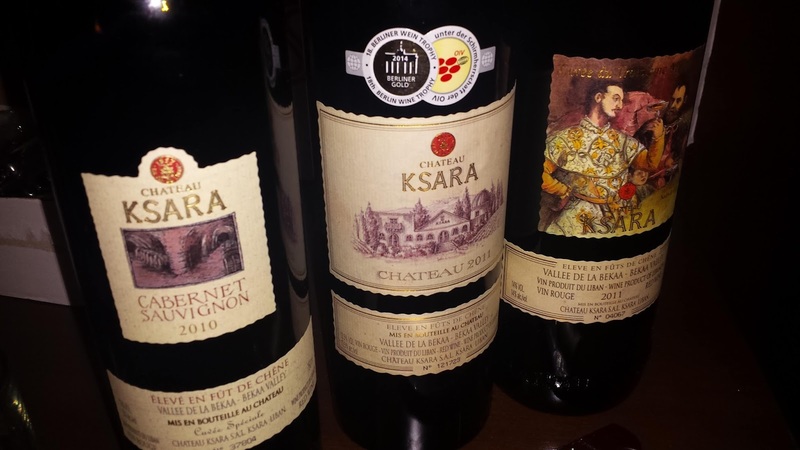 Maria Frangieh traveled the farthest to WBC15 in order to represent Lebanon's Chateau Ksara. Their wines were poured during a unique popup of Lebanese, Vermont, Virginia, and Maryland wines. Chateau Ksara is the oldest and largest winery in Lebanon, founded over 155 years ago by Jesuit priests in 1857. It is particularly impressive that the winery not only survived during the last three decades (which included civil war and Syrian & Israeli invasions), but expanded production. Ksara’s vineyards are located in the central and western Bekaa Valley. This Mediterranean climate valley has an average altitude of 1,000 meters, enjoys hot dry summers with cool nights, and its own natural water table from melting snow from surrounding mountain ranges. At WBC15, Maria poured three red wines produced from Bordeaux varieties: the Château Ksara made from Cabernet Sauvignon, Merlot and Petit Verdot grapes and oak aged for 18 months; the Cuvée IIIème Millénaire Ksara’s flagship red; and the 100% Cabernet Sauvignon. These were big and bold wines with structure and plenty of tannins. Looking forward to exploring more that Chateau Ksara and Lebanon have to offer. During that same tasting session, other wines are stood out. A 2001 Cabernet Sauvignon from an extinct Maryland winery Frederick Cellars (via Catoctin Creek Vineyards) showed amazingly well. Just ask WineOrl. 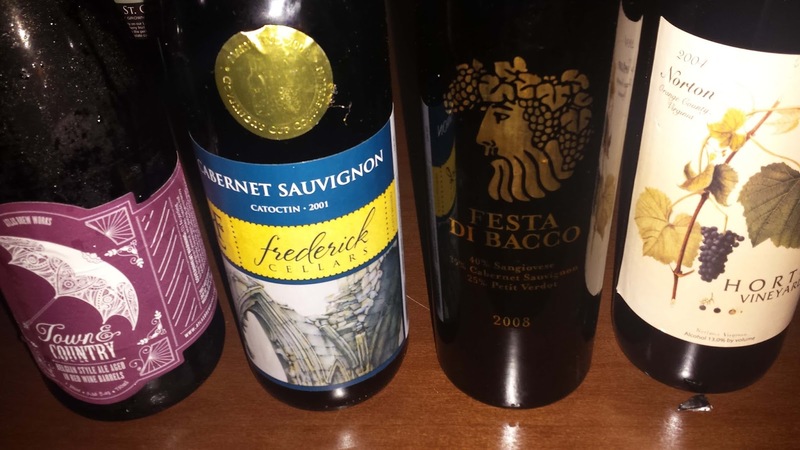 So did the Sangiovese based 2007 Festa di Bacco from Afton Mountain Vineyards. As for the Vermont wines, the Marquette from Lincoln Peak Winery and Shelburne Vineyard were very tasty - for any wine, not just for a Marguette wine. It was also the first time for many of the participants to sample the fabulous wines from La Garagista. Todd Traskos also brought along several home made wines and various samples of La Crescent, a much under-appreciated grape. 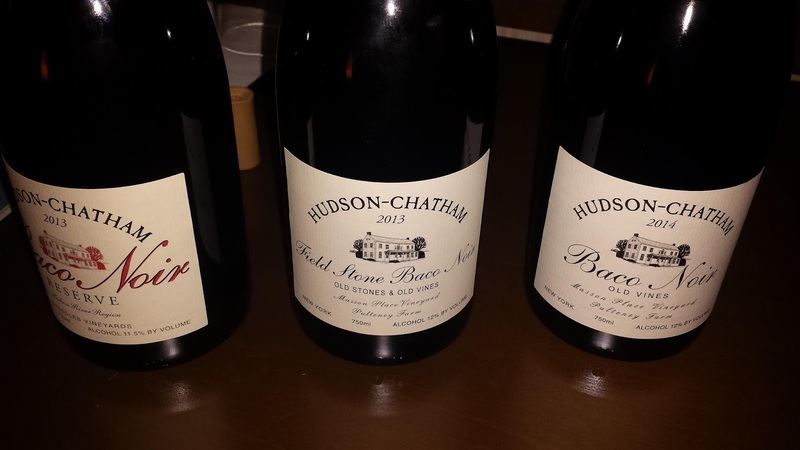 Thanks to Elizabeth, the TravelWineChick, several of us were able to sample more excellent red hybrids courtesy of Hudson-Chatham Winery. Of course, this means Baco Noir, the offspring of Folle blanche and an unknown variety of Vitis riparia. I have a soft spot for their Old Vines Mason Place Vineyards Pultney Farms, produced from 60 + year old vines and possessing several levels of dark juicy cherries with a touch of spice. The Field Stone Baco Noir was the most interesting of the trio; and very difficult to create an accurate descriptor. There's both dark fruit and pepper, some vege, some minerals - but ending softly. 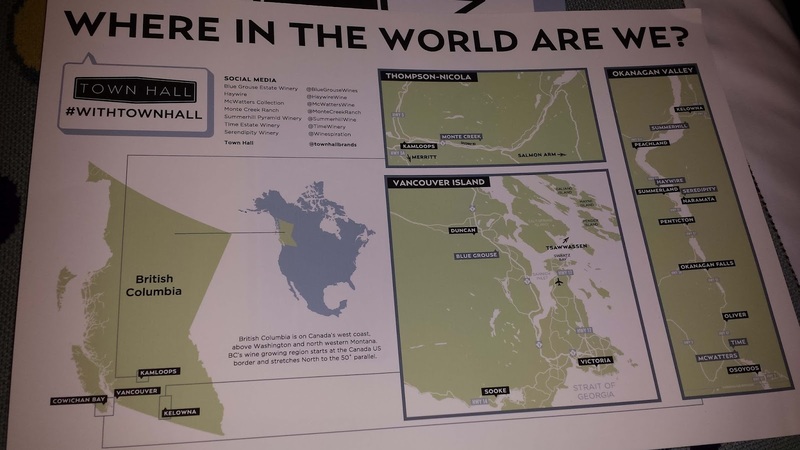 The final Rogue tasting to mention actually occurred the first night of WBC15 and was hosted by the most vivacious group at the conference, the #GoWBCCanada team pimping the Town Hall brands. There were several solid wines in this tasting particularly the Summerhill Pyramid Estate Winery Cipes Brut. 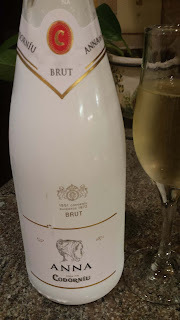 This non vintage sparkling wine revealed both nuts and citrus and finished both creamy and acidic. The Sandhill Wines 2013 Viognier was also nice, hitting the appropriate notes of peaches and apricots with a soft velvety texture. If only British Columbia wasn't so far away. Looking forward to what WBC16 and Lodi have to offer. Cheers. The folks at Protocol Wine Studio started September off with a venture into Spain and the Penedés region of Catalonia. This was where, in 1872, Codorníu winery's Josep Raventós produced his first sparkling wine using méthode traditionelle and Penedès grape varieties: the Macabeo, the Xarello and the Parellada. Thus "began the history of Cava". The winery dates back to 16th century and today is still the most popular Cava brand in Spain. 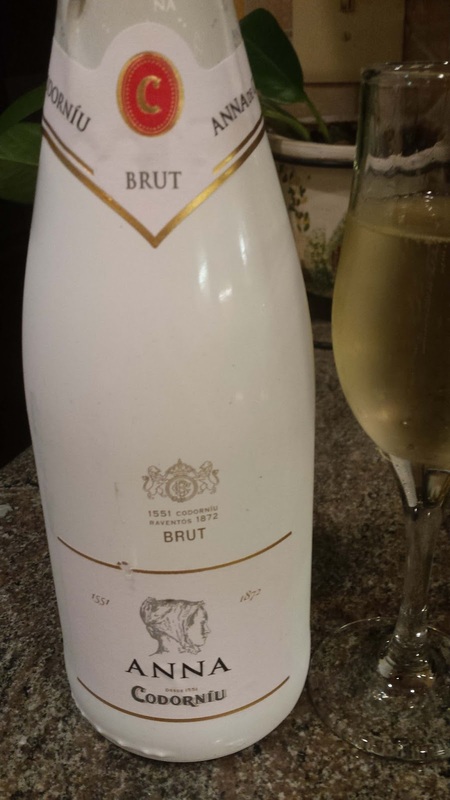 During our #WineStudio session we tasted the Anna de Codorníu Brut NV ($14.99, 11.5%), named for Anna, the heiress of Codorníu who married winemaker Miquel Raventós in 1659 and is the last descendant to carry the Codorníu name. After pioneering sparkling wine, Josep's son Manuel lead the effort to replant white wines after the phylloxera epidemic. Inventiveness continued into the next century when in 1984 the Anna de Cororniu Brut was the first Cava produced using Chardonnay grapes. The latest release consists of 70 % Chardonnay, 15% Parellada, and 15% Xarel·lo & Macabeo. This is a very tasty wine with abundant toasted and creamy tropical fruit and lemon flavors, slight spice; and plenty of effervescence. And at 15 bucks, more than a bargain. Cheers to that. Fall is a fantastic time to visit wineries and for those of us n NOVA, Loudoun County is a top destination. 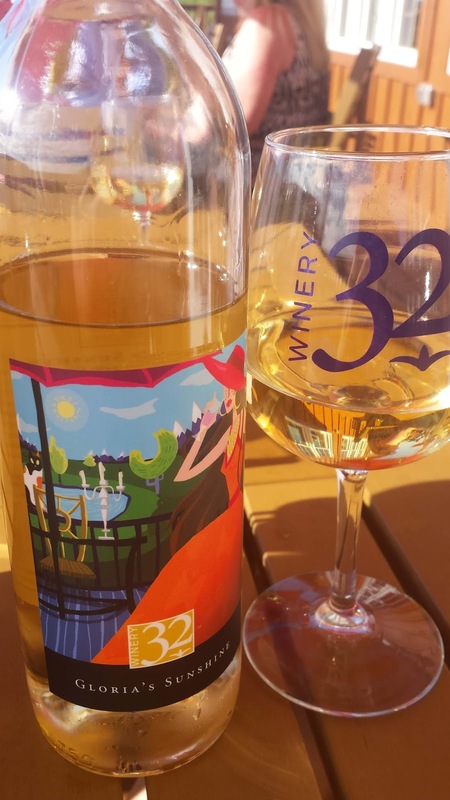 A relative newcomer in that area is Winery 32, located off Route 15 north of Leesburg. Roxanne and Michael Moosher opened the winery just over a year ago with the former a chemist, the later a chef. Seems like a perfect combination for a winery and bistro. 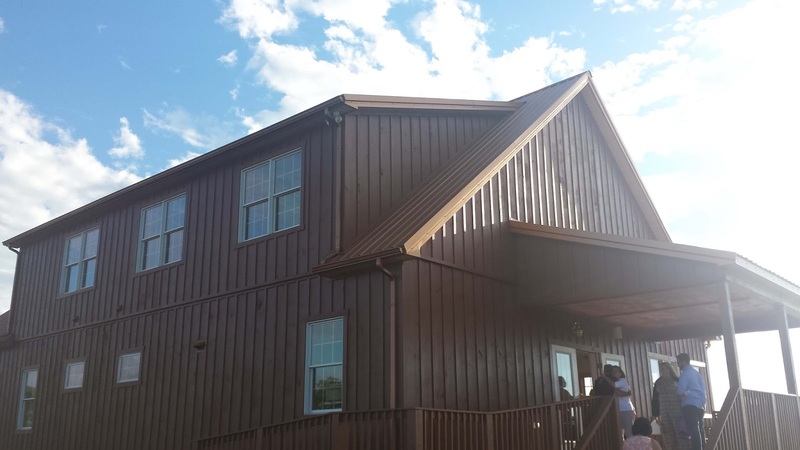 The property consists of 32 acres, encompassed by an abandoned horse farm and dairy farmland. The vineyard was planted during the Moosher's 32nd anniversary in which they also planted 32 peach trees. 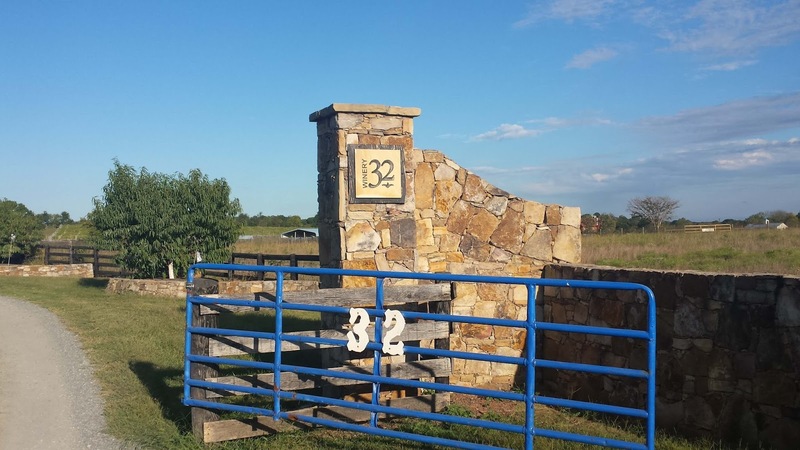 And as you already guessed by now, the reason behind the name Winery 32. 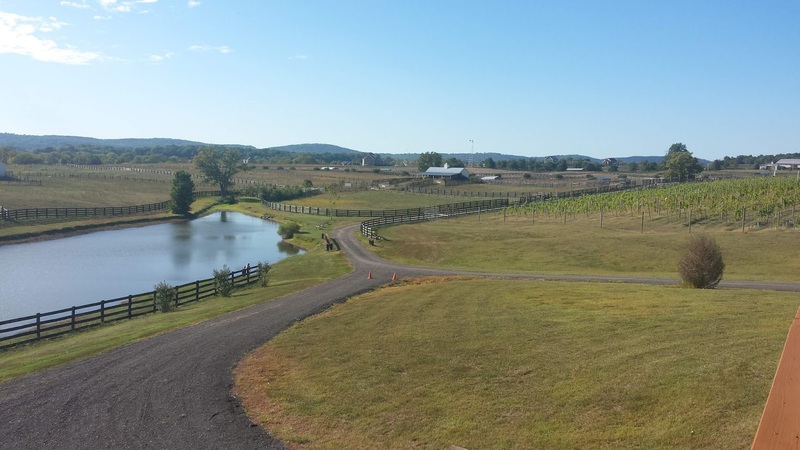 The winery is only open on weekend's and is right down Limestone Road from Fabbioli Cellars, thus a logical stop within the county's Potomac Cluster. The tasting room is spacious, with Michael's kitchen to the left, tasting bar on the right. It provides deck seating with ample views of the property's pond and the distant Short Hill Mountain (within the Blue Ridge Mountains). As for the wines, the first impression is the beautiful artwork on the labels drawn by their daughter, Chantal Moosher. The prints are also featured throughout the tasting room and are available for purchase. The second impression is that the wines are rather tasty. 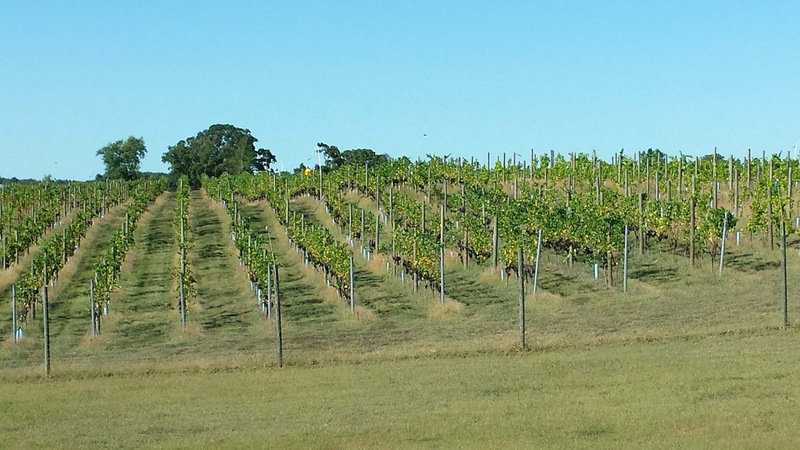 With their vineyards just reaching maturity, the grapes were sourced from mostly other Loudoun County vineyards. 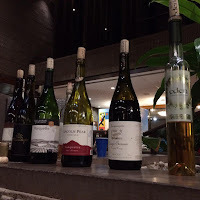 The whites consist of an off-dry Vidal & Traminette blend labelled 2012 Being Koi White Wine ($18); an oaked 2013 Chardonnay ($26), sourced from Trump Winery; Gloria's Sunshine Light Peach ($24), augmented with a smidgen of Vidal; and Gloria Peach Dessert Wine ($16.50. I couldn't get enough of the drier peach wine, the aromatics and off dry peach flavor won my attention. As for the reds, there's a California sourced Syrah ($22), Loudoun County sourced 2013Cabernet Sauvignon ($28) and 2012 Cabernet Franc ($18), and a Bordeaux styled blend known as 2013 Thoroughbred Blend ($26) that includes a small percentage of Charmbourcin. Of these, we preferred the Cabernet Franc, just a touch green and spicy, but more light cream and smooth tannins. Looking forward, it will be interesting how the character of the wines change once they start utilizing the estate fruit. One sure bet will be their Petit Manseng which Roxanne provided a tank sample. Despite still fermenting this wine is delicious now: abundant acids, flavor, and structure. Can't wait to return to sample the final product or the food pairing from the bistro. Cheers. 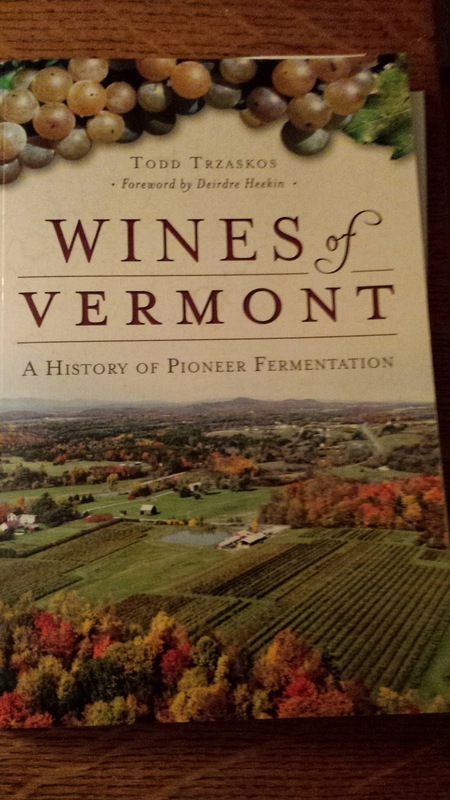 Book Review: "Wines of Vermont"
I have a soft spot for wine books that focus on the history of wine within a specific state *, so I was very enthusiastic about purchasing the recently published Wines of Vermont written by Todd Trzaskos. Full disclaimer, Todd is a friend that I've known for a number of years. And on occasion he has provided me with a couple of his excellent homemade wines that Deirdre Heekin mentions in the book's forward. That being said, this is an excellent resource, not only with it's portrayal of the past and present wine environment in Vermont, but more importantly, expanding upon the Green Mountain States' geography, history, culture, and agricultural industry. It's this expanded coverage which separates Wines of Vermont from similar books and provides an underlying basis for the rise of Vermont's unique wine culture. The book starts with a detailed review of Vermont's geography from the birth of it's mountains, to the limestone soils, to the consequences of past glacier activity. One interesting fact is that the Taconic and Green Mountain ranges "represent the eroded remains of some of the first mountains on earth...". Part II delves into Vermont's wine culture, from it's shared heritage with Quebec to the rise of the Farm to Table movement. Part III augments the Farm to Table culture by describing the plethora of fruit agricultural products grown in Vermont, finishing with a detailed description of wine grapes. Pay close attention to the Minnesota breeds. Part IV encompasses the Farmers and Winemakers who gave birth to and advanced the Vermont wine industry. I had expected the book to start with this topic, but by holding back this information, Trzaskos provides the reader with a clearer understanding of the risks and rewards experienced by these industrious entrepreneurs. Who in their right mind would plant Pinot Noir in the shores of Lake Champlain? Or bases their winery operation on native yeast fermented Marquette and La Crescent? The Wines of Vermont reveals this information and much more and forces the reader to admire and appreciate "the people from the little state of Vermont". * Two recent books are Richard Leahy's Beyond Jefferson's Vines: The Evolution of Quality Wine in Virginia and Regina McCarthy's Maryland Wine: A Full-Bodied History (American Palate) . 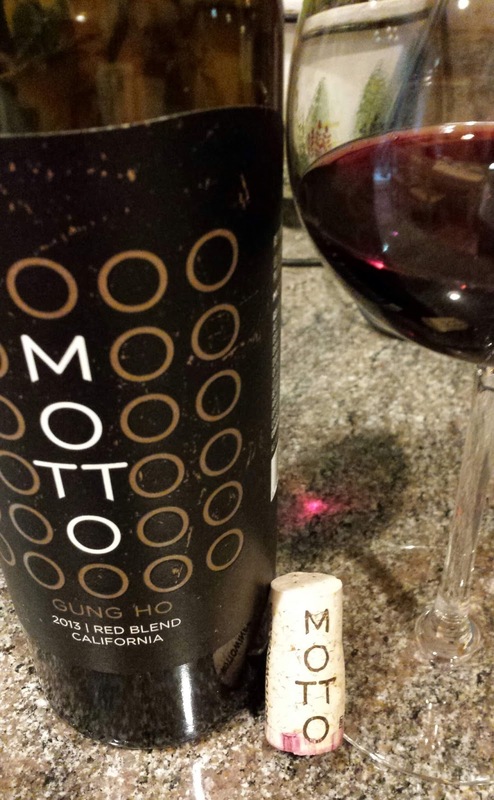 Motto Wines - "Bold & Rich" California Wine? With the supply of inexpensive wine growing, the challenge is to find brands that exceed the quality you would expect from this category. 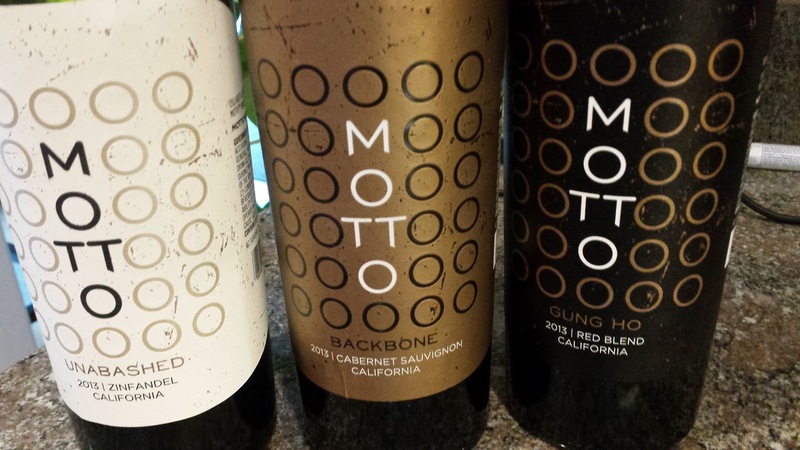 I received three such wines from Motto Wines, a new brand which sources California grapes and produces the wine at an SRP of $15. The brand markets themselves as producers of bold, rich, fruit forward wines by fermenting lots separately then blending right before bottling to create the most favorable profile. I found that claim true for their 2013 GUNG HO Red Blend (14.5%) - 60% Zinfandel, 23% Petit Verdot, & 17% Petite Sirah. The wine was aged for 10 months in a combination of older and once-used barrels as well as stainless steel tanks. This wine was quite pleasant with soft fruit flavors with a juicy creamy texture and easy tannins. Very approachable. 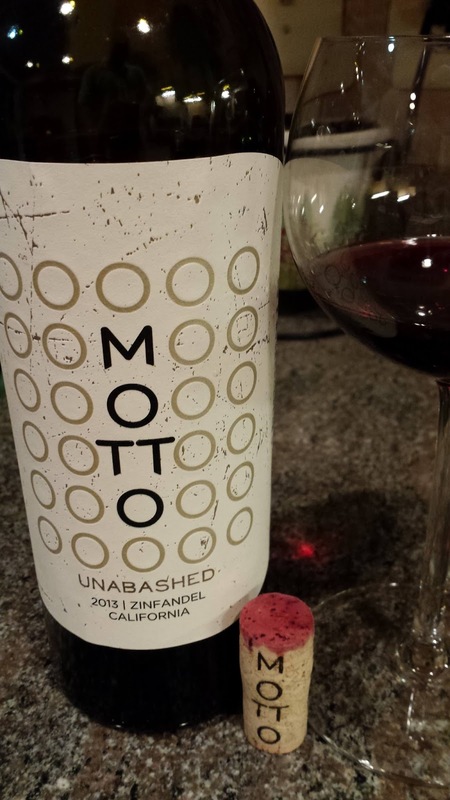 My next favorite was the 2013 UNABASHED Zinfandel (14.5%). Made in the same fashion as the Red Blend, this wine is more fruit forward, with a spicy red cherry profile and the same soft tannins, albeit with a little more spice. 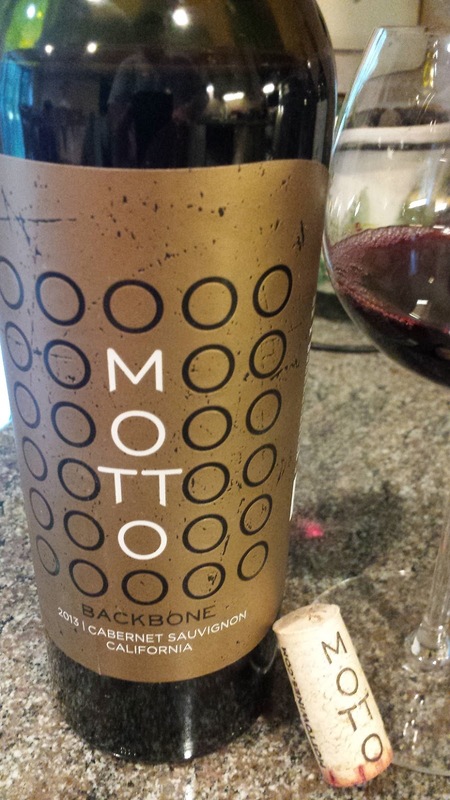 The final wine, 2013 BACKBONE Cabernet Sauvignon (14.5%), just didn't make an impression. Same production method, but the aroma started hot and the fruit fruit flavors intertwine with the tannins in a race to the finish. These wines may not be as Bold and Rich as advertised, but the Red Blend is a good buy at this price range. Cheers. Now that the 2016 Wine Bloggers Conference has been scheduled for Lodi California it's time to start researching the region's history and wine culture. The Lodi AVA consists of 90,000 acres of vines within seven unique sub-appellations. It has a Mediterranean climate with hot days cooled at night by ocean breezes. The soil? Primarily sandy. As for the wineries, a good place to start is Oak Ridge Winery. This is the oldest operating winery in the Lodi AVA and started in 1934 as a wine making cooperative of local grape growers. In 2001, Rudy Maggio and his partners, Don and Rocky Reynolds purchased the winery and retained many aspects of the historical property - for instance the building for Lodi's first tasting room. Today the winery produces several brands including its signature Old Zin Vines (“OZV”). The wine is made from grapes harvested from 50-100 year old zinfandel vines spread throughout the winery's various estate vineyards. Last week I received a couple samples of old vine Zinfandel from Oak Ridge. They are both reasonably priced wines at $14 and available in most states. Check out the winery's locator. 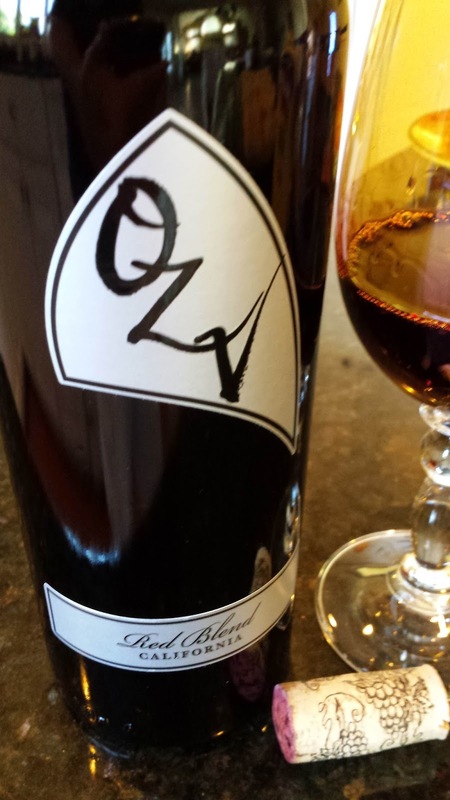 2012 OZV Old Vine Zinfandel ($14, 13.95%) - includes some Petite Sirah and Merlot, but primarily Zinfandel from 50-100 year old vines. The wine is both creamy and jammy with slight spices throughout. It finishes with very easy tannins. 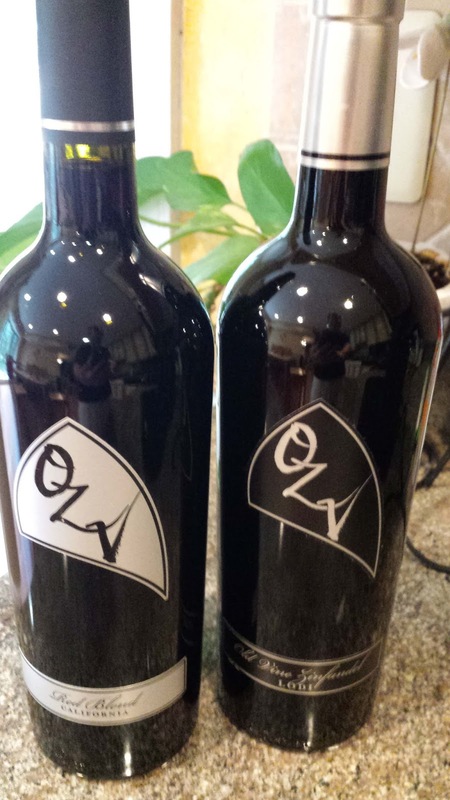 2012 OZV Red Blend ($14, 13.5%) - a blend of Zinfandel, Cabernet, Petite Sirah and Merlot. This wine is also jammy (red cherry) with more of a velvety texture, some spice, and more easy tannins. This wine was also a big hit at a family birthday party. Cheers to that. 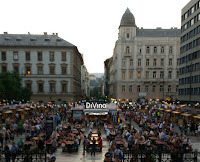 Hungary is where I first became interested in wine, sipping dry Furmint and semi-dry Olaszrizling at the Budapest Great Market Hall followed by Kadarka and Kekfrankos on trips to Eger and Sopron. During my recent trip to Budapest I looked forward to revisiting the world of Hungarian wine; but never imagined that I would stumble upon the Junibor Wine Festival held at St. Stephen's Basilica. 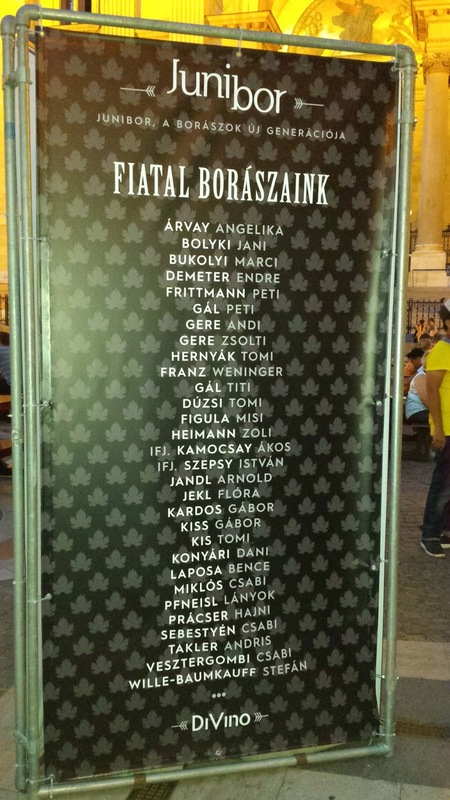 The festival featured wines from the Hungarian Young Winemakers' Association and represented all the major Hungarian wine regions from Sopron in the west to Tokaj to the east. Although the winemakers are relatively young, most of the wineries were from well established family wineries where the next generation was asserting their influence. Our presence at the Basilica was not a co-incidence. I had been in contact with Birgit Pfneisl, the highly regarded winemaker at Pfneiszl Organic Estate. I had become acquainted with that winery's Kekfrankos through the Blue Danube Wine Company. 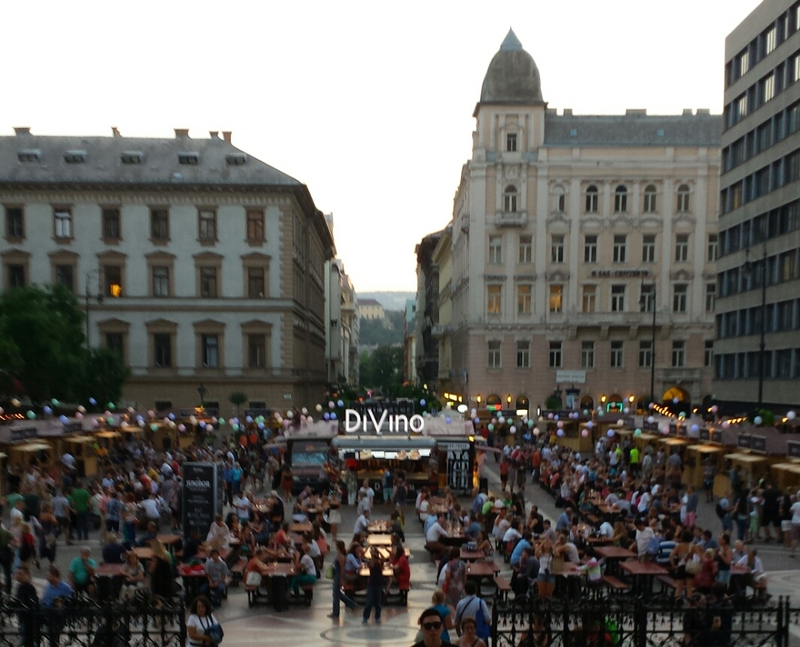 When Birgit had mentioned that she was in Budapest at the Basilica wine bar, I incorrectly assumed she was pouring at the Divino wine bar - not at a festival. The winery is located adjacent to the Austrian border in the northeast where Birgit is both the vineyard manager and winemaker and her sister Katrin marketing and sales. I discovered that the sisters speak German to each other which makes sense as they were both born in Austria. Their grandparents fled Hungary when the Communists gained control and had to cede the family land to the government. 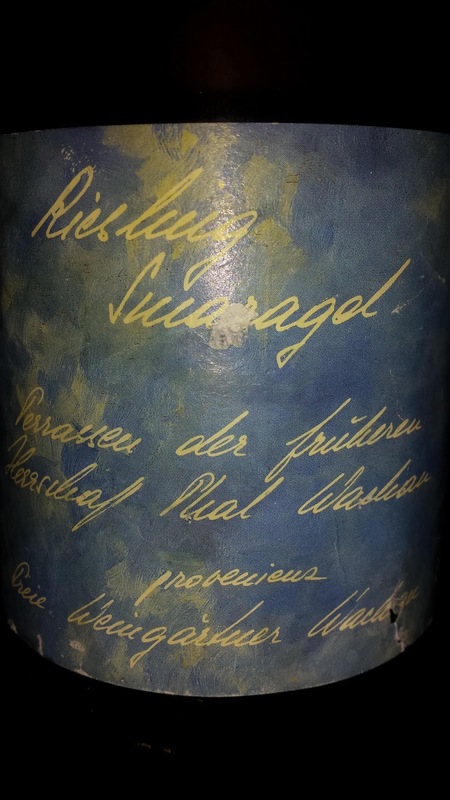 While in Austria, their Father and uncles started Weingut Pfneisl. In 1993 the family recovered their lost land in Hungary and renovated the property with the sisters responsible for the wine making operation. But Birgit gained plenty of wine making experience having interned in the U.S., Italy, Australia, New Zealand, Argentina, and Chile before returning to Hungary. These wine making areas are represented in her fabulous Távoli Világ wine - a blend of Shiraz, Carmenere, Malbec, Zinfandel, Sangiovese. In addition to this wine, Birgit poured her Merlot, Tango, and the "Köszönet I Thank you" Kekfrankos. This last is spectacular, jammy black fruit melding into a complex blend of fruit, chocolate, spice, and creamy dirt. 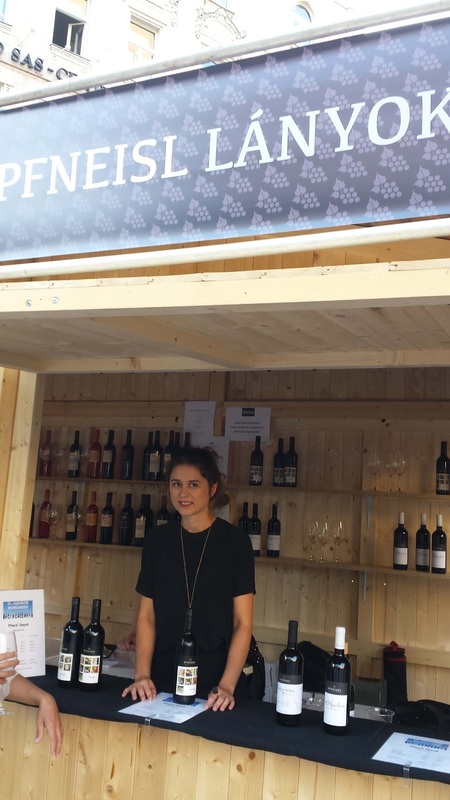 After sampling the Pfneiszl wines, the festival presented ample opportunities to sample Hungarian grape varieties as well as traditional international varieties. There was more Kekfrankos, Egri Bikavir blends, dry and semi-dry Olaszrizling, Portugieser, and Furmint. But one of the most unique was the Hungarian Királyleányka, which originated in Transylvania and now mostly grown in Eger. The Hernyák Birtok Etyek Királyleányka possessed a strong floral aroma followed by a crisp citrus and mineral flavor profile and noticeable acids. 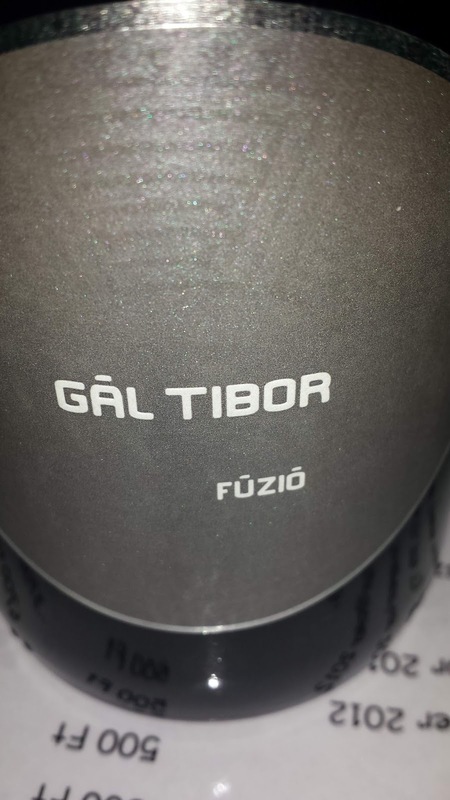 Another unique wine was the Gál Tibor FÚZIÓ 2012, a blend of Viognier, Riesling, and Traminer, which was aged 15 months in oak. This is an elegant wine, one I returned to for a second glass. Part citrus, part stone fruit, some spice, some vanilla; completely enjoyable. 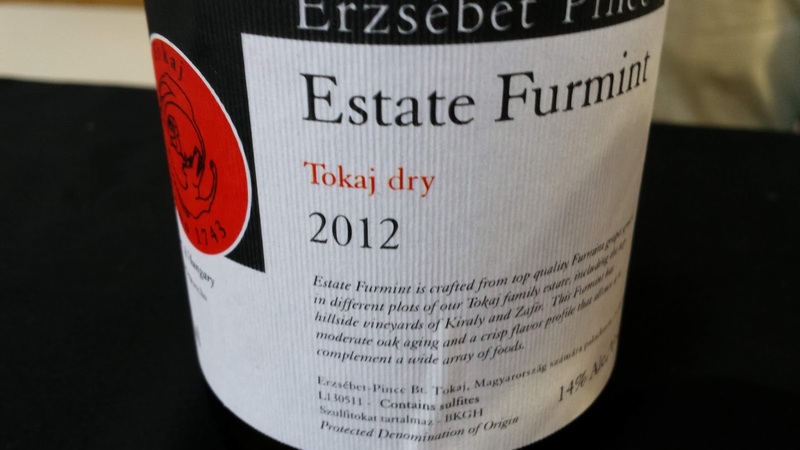 Finally, I have to mention the dry Furmint. Yes, the Tokaji dessert wines get most of the attention, but I am particularly drawn to the dry version. The first to note was the 2012 Estate Furmint from Erzsébet Pince, which I had tasted previously on our trip at various restaurants. I was also familiar with the winery from a WineStudio tasting last year. This wine combines flavors of stone fruit and minerals with crisp acids - a very nice wine. But one to actively seek is the Tokaji Padi-hegy Furmint 2012 from Árvay Családi Pincészet. The wine's saline minerality seizes your attention, then subsides to delicious stone fruits and crisp acids. I still haven't found a source to purchase this wine, but hopefully Blue Danube will pick up one day. Cheers to Hungarian wine. New York state provides very liberal regulations for farm wineries, breweries, and distilleries provided they utilize New York grown agricultural products. As a result, the number of establishments within each of these categories are growing, with over 50 distillers of grain and fruit. You won't find much rum within this group from the obvious fact that sugarcane doesn't fare well in the Empire state. And thus NY distillery's that produce rum from imported molasses or sugarcane, such as The Noble Experiment NYC and The Albany Distilling Company, do not operate with a farm distillery license. Enter Buffalo based Black Squirrel Distillery. This operation creates two rum products using a New England staple, maple syrup, Black Squirrel and Mapleshine™. Bother are produced from New York harvested maple sap which, if you think of it, has the same texture as molasses and both are composed primarily of sucrose. And according to Jason Schwinger, maple syrup "adds some truly unique character that cane and molasses rums could only dream of". That being said, the Mapleshine™ is produced by fermenting and distilling this syrup; whereas the Black Squirrel is then aged in re-coopered French oak barrels and American oak. Seems like a nice rum product right? Nope. The Alcohol and Tobacco Tax and Trade Bureau (TTP) which regulates the labeling of alcoholic products at the federal level will not classify this product as Rum. To the bureaucrats, rum is a "spirit distilled from fermented juice of sugar cane, sugar cane syrup, sugar cane molasses, or other sugar can by-products" -- not from maple syrup. Otherwise, as an uninformed consumer you'd be confused. 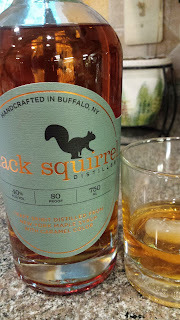 Last month the distillery sent me a sample bottle of Black Squirrel and the first thought is there is only a slight hint that maple syrup was the spirit's primary ingredient. The nose exudes a honeyed nut aroma, with the flavor profile sweet caramel. Whether neat or with a drop of water, there is little noticeable burn - just a long smooth honeyed caramel finish. I also mixed as a base for my favorite rum cocktails like Hemingway's Josie Russell. Works perfectly, just like a classified rum spirit. Cheers. Yes, wine was obviously the focus of the 2015 Wine Bloggers Conference, but the Finger Lakes also provides ample opportunities to sip other locally produced boozy products. It started with beer when I first arrived in Corning. 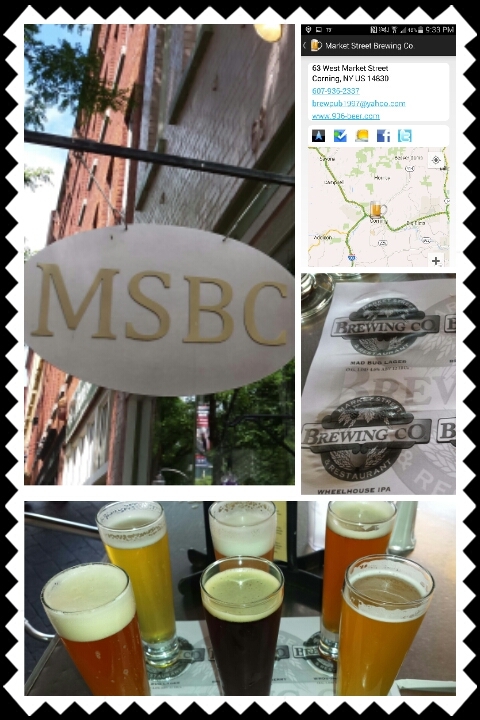 The Market Street Brewing Co. was only a few blocks from the host hotel and with a few hours to kill before the bus left for the Seneca Lake pre-excursion, I settled in with a sampler. The beers range from Lager to IPA, Wit to Red to Brown, with the simple Mad Bug Lager dampening the driving nerves and refreshing the palate. Cider made it's first appearance during the Seneca Lake pre-excursion at our visit to Ventosa Vineyards where Autumn Stoscheck was pouring the Eve’s Cidery Autumn’s Gold Traditional Method Sparkling Cider. 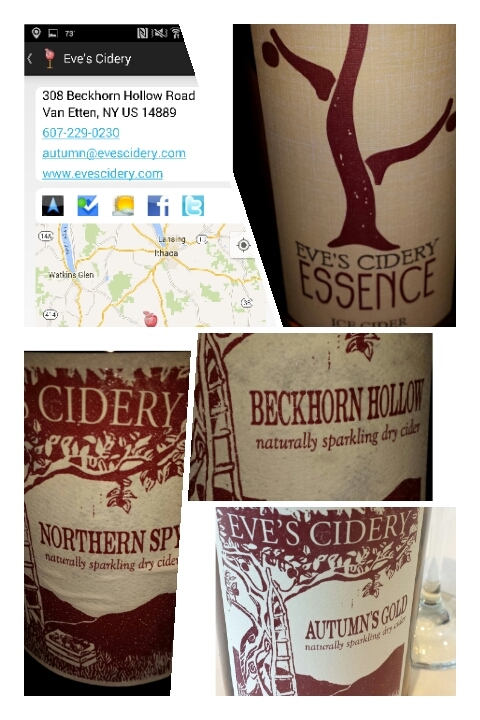 This cider received many compliments and thanks to Tom Wark, during the conference I was also able to sample more sparkling cider from Eve's such as the 100% varietal Northern Spy and orchard designate Beckhorn Hollow. This last was my favorite, probably from it's pronounced tartness and citrus profile. It's produced from a complex blend of Golden Russet, Wealthy, Wixson, Cox Orange Pippin, Northern Spy, Manchurian Crab, Spigold, and Idared apples. Tom also shared their Essence Ice Cider, made using cryo-concentration (the freezing of late harvest juice). There's plenty of sugar at 15%RS, but completely balanced with the apple's inherent malic acidity. After the Ventosa visit, many of us ended the evening in Geneva at Lake Drum Brewing, a new craft brewery owned by Victor Pultinas and Jenna LaVita (vineyard manager and wine maker at Ventosa). She is one busy young lady. In addition to beer, the brewery also produces cider; but it was two sour beers that attracted my attention: the Wild Ale and Brett BBL #1. 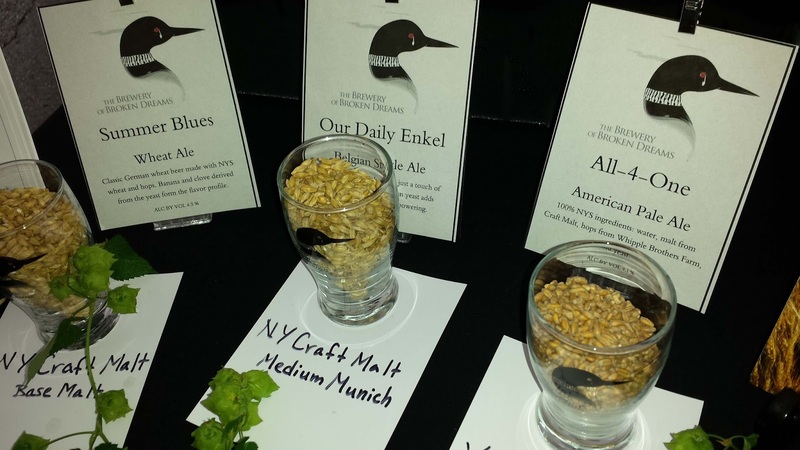 Victor informed me later that both were made with 50% NY malted barley. The Wild Ale is the lighter, more floral of the two as it contains some hibiscus in the mash tun, and inoculated with lactobacillus for tartness. The Brett BBL #1 is much more complex with a complete funky nature. Victor describes its creation: "The Brett was made in December as a Pale Ale that went into a Chardonay barrel from Hosmer Winery. It went through a secondary fermentation in the barrel with both brettanomyces and lactobacillus. It sat in barrel for just about eight months developing a light sour tangy taste stemming from the brett bacteria". This is one serious beer. Also serious is the Apple Country Spirits Pear Brandy (rested in oak barrels) that I opened at Lake Drum. New York law allows craft breweries to sell New York craft spirits, but only by the bottle - not by the snifter. As a consequence I probably consumed more than necessary but it was hard to stop enjoying this eau de vie styled brandy with it's smooth creamy pear flavor. No wonder the spirit was awarded a Gold medal at the 2015 San Francisco World Spirits Competition. Another brewery that showed well at the conference was The Brewery of Broken Dreams, who poured under the tent at lunch.They are located on Keuka Lake in Hammondsport and offered three solid beers at the conference: Summer Blues Wheat Ale, Our Daily Enkel Belgium Styled Ale, and All-4-One American Pale Ale. Another Keuka Lake brewery, LyonSmith Brewing Co., supplied a couple growlers for our mystery bus excursion destined for Keuka's Inn. The brewery specializes in British styled ales, with the 1814 Flood Porter the first choice of many. Named after the tragic London flood caused by the rupture of a large fermentation tank of Porter, it's a smooth beer with a hint of hops and plenty of mocha flavors. 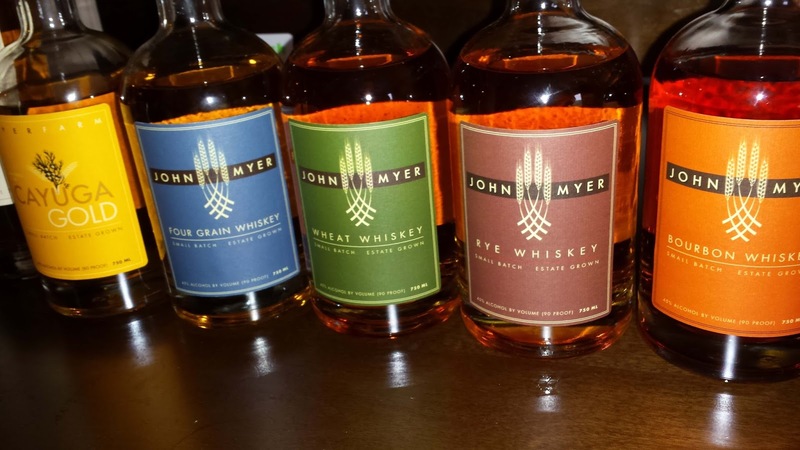 Myer Farm Distillers appeared at the conference during a popup tasting. This organic farm to flask distillery located in Ovid grows the grain as well as distills and bottles their distillates directly on their farm. There were a plethora of spirits including the Cayuga Gold Barrel Aged Gin and various whiskeys. The Four Grain Whiskey and Wheat Whiskey were very smooth with vanilla caramel profiles, with the Rye Whiskey being naturally a little spicier and hotter, and the Bourbon Whiskey showing sweet roasted corn flavors. As for the Cayuga Gold, with the absence of juniper, it comes across more of a whiskey with maple flavors. 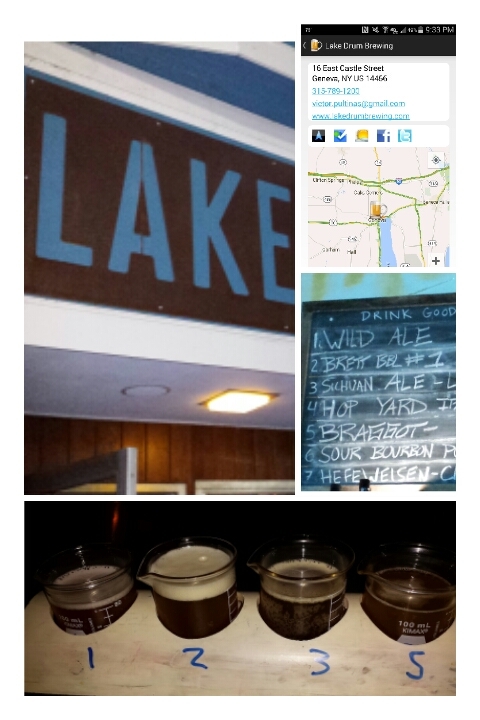 Finally, the post-excursion Cayuga Lake offered a couple other opportunities to sample Finger Lakes cider and spirits. 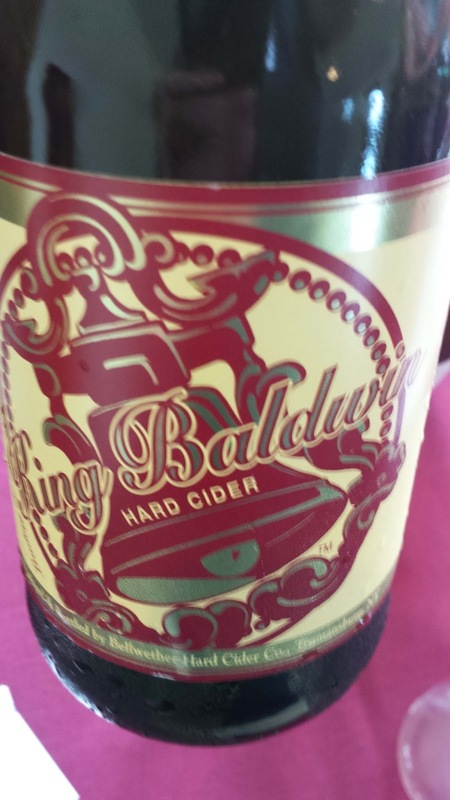 Bellwether Hard Cider provided a few ciders starting with their King Baldwin, an off-dry cider that comes across very dry with the apple's acidity factored in. It's a blend of Tompkins King and Baldwin, thus the name. Their Northern Spy based Bellwether Lord Scudmore sparkling cider is also very tasty with tart citrus flavors. 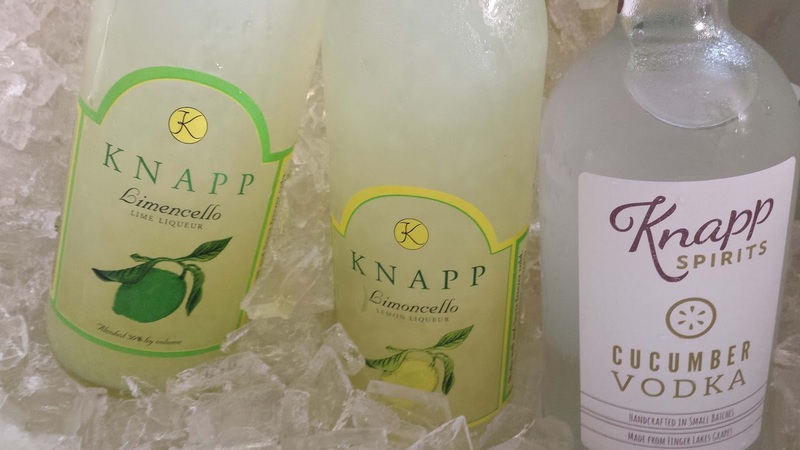 At our dinner at Knapp Vineyards & Winery we were introduced to that winery's distillates featuring Limoncello and a Cucumber Vodka. The vodka was fresh and clean, little burn; whereas the lemon and lime Limoncellos were two distinct beings - both reminiscent of the appropriate fruit - oily and refreshing to the palate. So, if you find yourself vising Finger Lakes wine country, enjoy the many fine wines produced in the area. But don't ignore the many excellent cider, craft beer and spirits within the region. theCompass Winery, Brewery, Distillery Locator Mobile App will help you locate them. Cheers and safe travels. The beauty of each year's Wine Bloggers Conference is you never know what type of wine you will discover, whether from the year's host region, New York's Finger Lakes in 2015, or from another region. This year I tasted wine made in Lebanon, Brazil, Vermont, Maryland, Virginia, British Columbia, along with more traditional wine making regions in Germany, Austria, Italy, Chile, and Argentina. But it was tasting wines from Spain where I had the most memorial experience. Late to the Friday afternoon lunch, I settled down at the first open table and was soon accompanied by Carl Giavanti of Carl Giavanti Consulting. We were seated across from who we would later learn to be Peter Deutsch and José A Hidalgo (El Muro del Vino). After listening to their conversation we remarked about Peter's English accent but impeccable Spanish. He then explained his negociant background and the launch of his new brand Finca Hispana which focuses on small producers throughout Spain. At the end of our conversation he invited us to his conference after party to taste these wines. I was intrigued. After the Rockwell Museum visit I hurried over to the designated room just as José was propping up a large vertical display sign to prop open the door. There weren't that many visitors the first night, so this evening started with just me and José tasting two of his wines, the easy drinking Campos Reales Tempranillo ($10) and the more complex Darcio Rioja Reserva ($20). The grapes for the first wine were grown in D.O. La Mancha and José opened Google Maps on his phone and we spent an entire glass zooming to the specific vineyards. Can't get more intimate than that. Plus the wine was fantastic - very easy drinking and heavy on the blackberry. As for the Rioja, I'll let Aurelio Montes, of Kaiken Wines, describe: "It is a wine with great fruit expression, where the wood is well integrated with the wine. 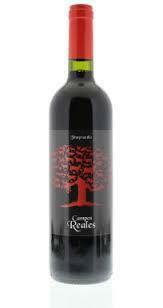 The palate is elegant, soft tannins, good volume". 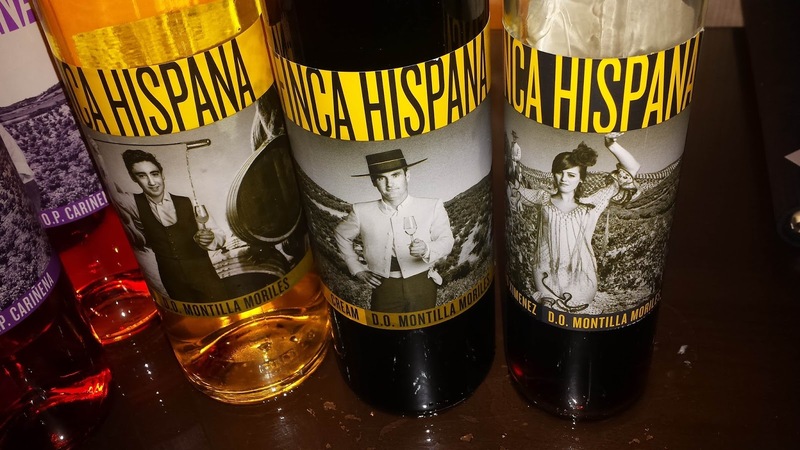 By this time, Carl and Todd Trzaskos, author of the newly released Wines of Vermont , joined me and we turned our attention to Peter and the Finca Hispana brand. The first item to note is that almost all these wines retail for less than $15. Second, they come with attractive packaging. The label consists of a photo of the winemaker(s) providing a personal connection between consumer and producer. And being a small group Peter was had time to discuss each winemaker, each region, and each grape. Finally, the wines are simply delicious with ridiculous values. One of the early favorites was the Finca Hispana Garnacha/Cariñena Roble, 2011 ($15, 13.5% ABV) produced by the Cristobal family. The wine itself is a 50-50 blend of Garnacha and Cariñena, made grapes harvested from 80+ year old vines in DO Cariñena, located in northern Spain. It is a full bodied wine, with a juicy and chewy texture, finishing with plenty of spicy tannins. 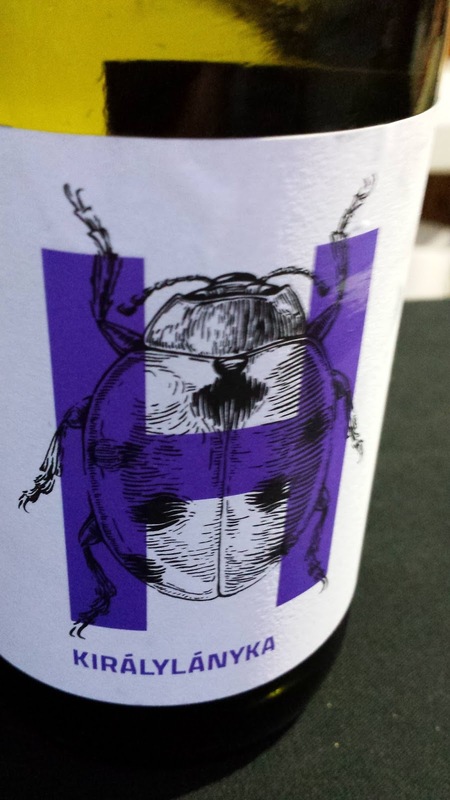 Another wine I returned to was the Finca Hispana Garnacha/Carignan/Syrah DO Monsant ($10, 13.5% ABV). The blend consists of 40% Garnacha, 40% Carignan, 20% Syrah all from vines aged between 30-60 years old in DO Monsant - the center of Catalonia and surrounding DOQ Priorat. This is a juicy fruit forward wine produced by the label model Eugènia Guasch López. Eventually the tasting turned to three sherries and the true love affair began. Two of these had graduated from the traditional Solera system, 36 years in all, and are of course comprised of 100% Pedro Ximenez. The clear attraction was the Finca Hispana Pedro Ximenez, NV ($15, 15% ABV) produced by Marta Leiva Vilchez in the D.O. Montilla Moriles appellation. The wine is luscious, with a jammy fig and tobacco profile, and a lingering dry finish. We would have continued yet the hotel security threatened Police action, so off to bed. But they promised to re-open the next evening. And obviously news about the wine had spread. The next evening I arrived a little late after tasting some cider and could barely fit through the door. I had promised to share some local cider and beer and found myself pouring Maryland's Millstone Cellars Farmgate cider to both José and Aurelio Montes. What a treat discussing the cider and having them compare the cider's qualities to wine faults. Over time we switched over to Virginia's Old Ox Brewery Kristin’s Passion, a Mexican Hot Chocolate Porter, and a couple from O'Connor Brewing Co.. Once again the evening ended with sherry and the hotel security. Finca Hispana hits is available in most other East coast markets and Chicago and hits the Virginia market later this year. Can't wait. Cheers.